It was difficult for me to find the exact English equivalent for Sweet Tau Kee or Sweet Tou Kan, a type of soya product which is popular amongst vegetarians. Sweet Tau Kee comes in rectangular dried hard pieces and are brown in colour and you will need to soften them by pre-soaking in water for a few minutes prior to cooking. I have had experience where certain Sweet Tau Kee softens much faster than others depending on different manufacturers. After they have softened, you should cut them into smaller pieces as they measure approximately 15cm in length and 5 cm in width prior to cooking. Sweet Tau Kee is not for everyone due to its unique taste, which can be bitter to some. 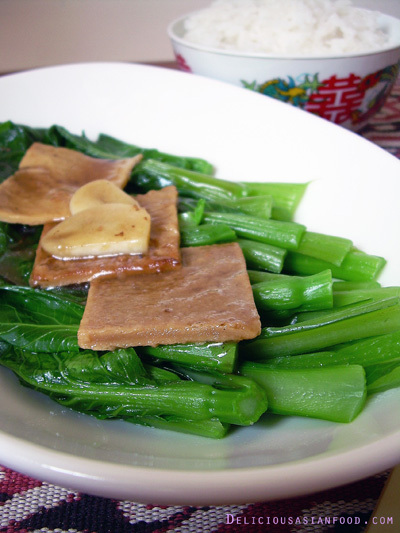 Here, I have paired the Sweet Tau Kee with Choy Sum (èœå¿ƒ) or “Flowering Chinese Cabbage” so that there is a good balance between the subtle sweetness of the Tau Kee and the refreshing Choy Sum greens. This dish is quite easy to cook and with a little effort in presentation, you can dish out something which can rival what is being offered in the chinese restaurants. 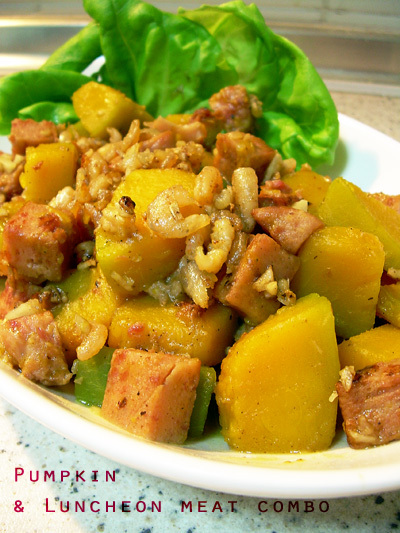 By the way, if you intend to serve this as a complete vegetarian dish, omit garlic from the ingredients. I once ate something similar from a chinese take-away and decided to give it a try. The Napa Cabbage used in this dish is also known as Chinese White Cabbage (å¤§ç™½èœ) or similar to Kimchi. It is longish and sweet in taste and widely used in East Asia. Though I usually stir fry this dish or use them in soups, this is my first attempt at steaming them after rolling them up like popiah. There are 3 main steps to this dish. Preparing the stuffing, softening the cabbage and steaming the cabbage rolls. 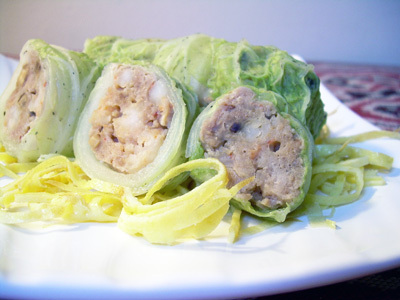 This recipe makes about 10 to 12 rolls with each roll using a single napa cabbage leaf. Actually, the stuffing can be left to your creativity. I used pork and prawns here. You can use fish paste, chicken meat or even beef or lamb mince depending on the seasoning applied. Sweet Potato shoots goes well with fermented beancurd and it’s quite common to find this dish in chinese eateries in Malaysia. Miso Sweet Potato Shoots however, was more an accidental finding as I had run out of fermented beancurd on the very day that I decided to stir fry some sweet potato shoots. 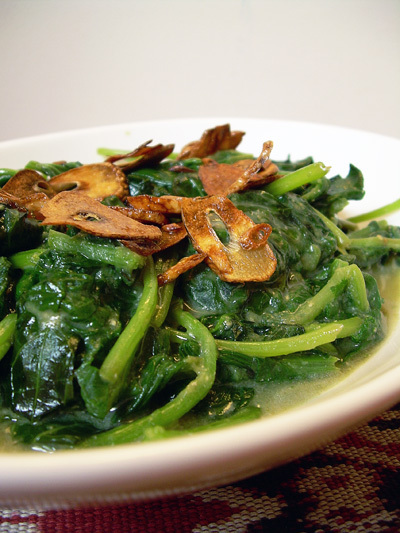 With two little kids at home, stir frying the sweet potato shoots with belacan was out of the question. As I rummaged through my fridge for ideas, my eyes set upon the pack of miso paste on the slider drawer and I thought this is it! As miso paste is also some form of soybean product, I thought that it might taste as good with the sweet potato shoots just like fermented beancurd. And I was right! It tasted great especially with fried garlic slices which had a little smoky flavour. However, taking the cue from readers who told me that miso must not be boiled, I had to get around the problem of cooking the sweet potato shoots without cooking the miso! So, it turned out to be a two part cooking process – blanching and quick stir frying. If you have miso paste at home, don’t just settle for miso soup. Try this for a change.